Coverage of the BMW Asian Open, a professional golf tournament co-sanctioned by the European Tour and the Asian Tour. A version of this story appeared in the May 1, 2005 edition of the South China Morning Post (subscription only). SHANGHAI — China’s top-ranked golfer Zhang Lian Wei criticized his government and Chinese companies Saturday, delivering an emotional post-round press conference that elicited applause from members of the Chinese media covering the BMW Asian Open at Tomson Golf Club. Zhang, who turns 40 on Monday, said he has never received any state funding during his historic 11-year career. He added that he has zero domestic sponsors. 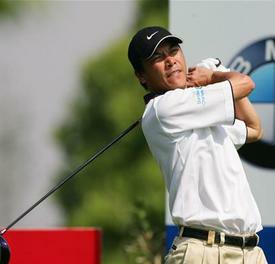 In 2003, Zhang became the first Chinese and only the fifth Asian to win a European Tour event, defeating Ernie Els by one stroke to win the Caltex Masters in Singapore. Last year, he became the first Chinese golfer to play in the U.S. Masters tournament at Augusta National. Zhang gave up a state-funded life as a javelin thrower when he discovered golf while living in Zhuhai in southern Guangdong province in 1985, just one year after the first post-Liberation golf course was constructed in China. He worked as a caddie and taught himself to play. While golf has grown exponentially in China over the last two decades, it still remains a fringe sport for most of the Chinese population. Zhang proposed that golf’s governing body in China allocate 10 to 20 percent of its budget to supporting its athletes. Zhang shot a third-round 69 on Saturday and enters today’s final round at 6-under, 13 strokes behind a seemingly unstoppable Els. Last week in Beijing, Zhang finished 63rd at 1-over in the Johnnie Walker Classic. Zhang’s pointed remarks came in response to a question about what life is like outside of China’s state-funded sports system. Minutes later, the same question was posed to 26-year-old Liang Wen Chong, China’s rising star in golf. He declined to comment. See how this story looked in the South China Morning Post (PDF file). hi, your website so nice, I would like to read some news from your website frequently. Interesting to see Zhang finally speak up. I am a US golf pro and have been here for about 8 years. I have known Zhang for about that long. He is absolutely correct that the government and the China golf Association are doing nothing right to help develop the professional game in China…..only lining their on pockets with sanctioning fees from the Euro and Asian tour events they are hosting. Really a shame that the only hope for the future of golf lies in the kids with enough money to go overseas to study full time at David Ledbetter Golf Academy in Florida.